When it comes to cooking a new or an old and favorite family meal, anything that has cheese in it is a winner in our household. By now you are all aware that my family’s favorite food to eat is Mexican. 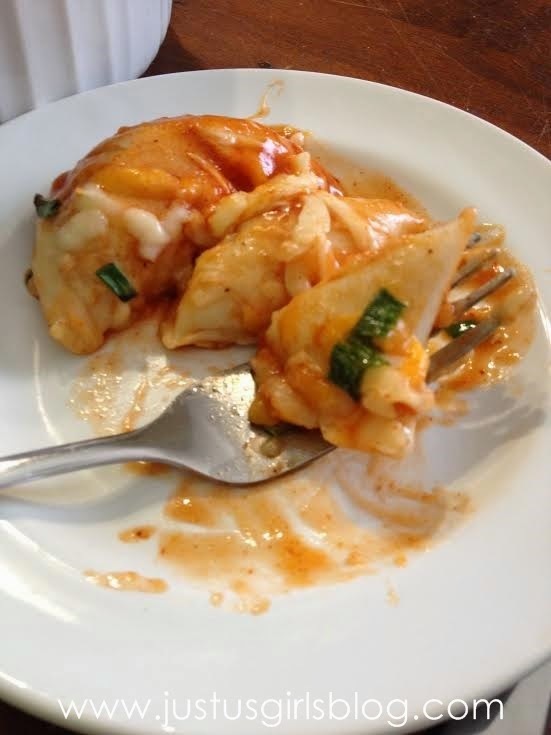 The meals are delicious, cheesy and just enough spice to kick the meal up a notch. Well, I decided to do something different and put together both my favorite Mexican meal with a Canadian favorite, Perogies. My family loves both and I thought I’d give it a go mixing the two to see how they would turn out using the new Kraft Shredded Cheese with a Touch of Philadelphia. The new shredded cheese comes in three different flavors, Creamy Mozza, Creamy Heard & Garlic and Creamy Mexicana. The Mexicana was the perfect flavor to use with this meal. 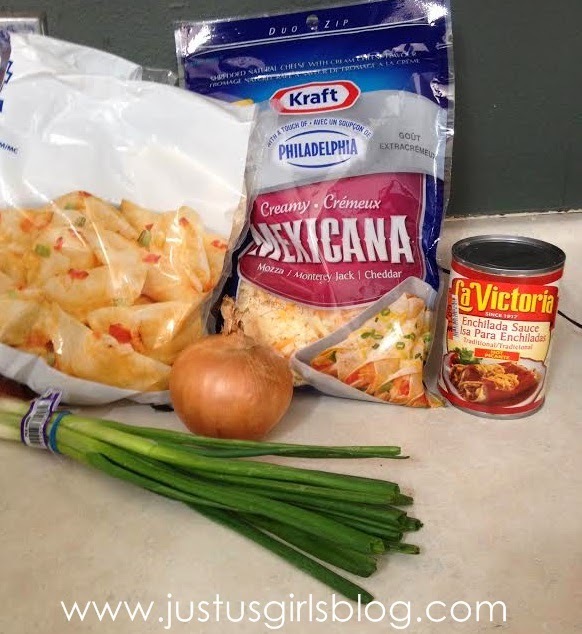 Kraft has blended their Kraft Shredded Cheesewith a Touch of Philadelphia to give their devoted customers a soft and creamy melt that will make our favorite meals even better and let me tell you, using the Mexicana cheese did just that for my Enchiladas Perogies. Not only did we get the creaminess of Philadelphia Cheese that we love, but as shredded cheese was even better! Directions: Preheat oven to 350F. In a frying pan add your butter, let it melt on medium heat and then add your chopped up onion. Let cook for a few minutes and then add your unthawed perogies. Once golden on each side place in a casserole dish and season to taste with salt and pepper. Open can of red enchiladas sauce and pour over the perogies. 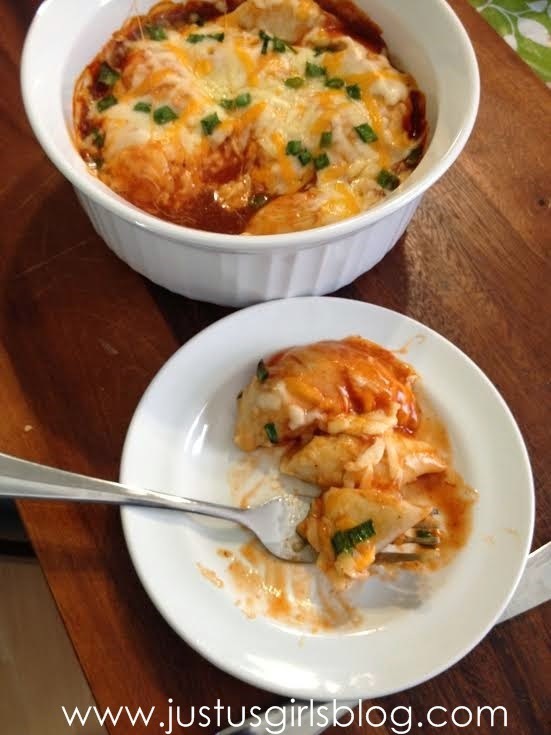 Add your cheese and chopped up green onions and place in oven until cheese has melted. 15-20 minutes. Take out of oven, let cool and enjoy. In celebration of Kraft’s new Shredded Cheese with a Touch of Philadelphia, Kraft is having a twitter party and you all are invited. Be sure to attend as there will be lots of great convo about our favorite recipes using Kraft. 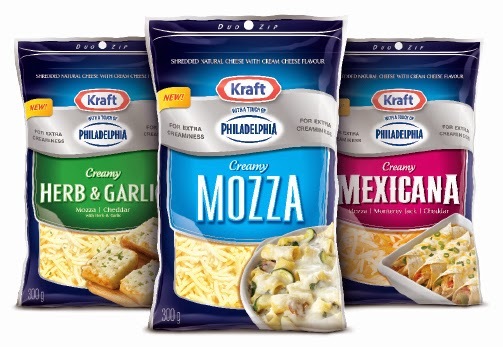 You can also check out Kraft Canada to get the scoop on new recipes that include Kraft Shredded Cheese with a Touch of Philadelphia!